Sarah Palin: Media Sideshow, Or Viable Candidate? Sarah Palin is drumming up controversy like it's her job. Which, right now, it is. As Newsweek defends itself against charges that its cover of her is sexist, Washington insiders are arguing over how seriously to take her political future. 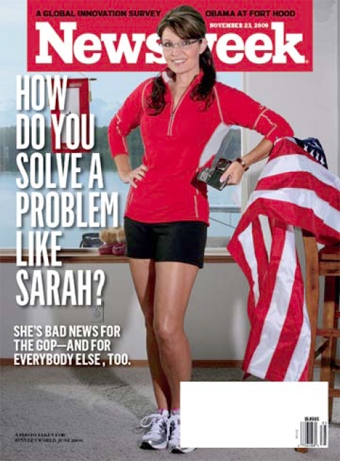 On the Today show this morning, a Newsweek editor, Dan Klaidman, defended the magazine's choice of a Runner's World photo to illustrate its two stories critiquing Palin as a political figure. He basically stuck to the magazine's talking points, arguing that the picture did "illustrate the themes of the cover story," which is to say, that Sarah Palin lacks gravitas and exploits her all-American image. The story is about why Sarah Palin is a problem for the GOP. The picture answers the question. She's a problem because she's a freak with no judgment who regularly makes a spectacle of herself. So does this "freak" matter as anything other than as a momentary soap opera for politics junkies? On Today, Tina Brown put forward a theory that's growing in steam (and that liberals fervently wish to be the case): "[Palin is] really not remotely interested in politics as far as I could see... She really was quite happy to play as a celebrity talk show guest, and she did a fabulous job at that." And yesterday, Ana Marie Cox told Rachel Maddow that McCain staffers believe Palin has no intention of running for office, adding, "This is as famous and politically credible that she's going to be." The widespread suggestion in some of the media commentary that she simply isn't qualified enough to be considered a viable presidential candidate is ridiculous....Call it sexism or what you will, but why should the media only compare ambitious women to impressive men, when so many ambitious but underwhelming men get so far in this world? Media debate about why Palin is getting all this attention is also pretty laughable. Cable and network news producers cover her on television to boost ratings, print editors put her on their front pages and magazine covers to sell newsstand copies, and then everyone turns around and tsk-tsk's: "What's all the fuss? Is she good for the GOP? Is she good for America?" That would be, more or less, the headline Newsweek itself went for. Except they went ahead and said that the answer is no, she's bad for both. Update: Politico's Ben Smith takes the pulse of the presidents of various feminist organizations on the Newsweek cover. Their response is basically to shrug. White House Project president Marie Wilson: "It's much more complicated than sexism... What the [Republican] Party was selling, and people were buying — and what the candidate colluded [in] — is what shows up in that Newsweek picture." And Terri O'Neill, the president of the National Organization for Women, says that while Palin has been at times a victim of sexism, this cover isn't an example of it. She adds, "Women's right's organizations are really clear that we're struggling for the rights of ordinary women...Sarah Palin is not with us on that."